A few weeks ago, I came across this article that someone had posted to social media with the title “Your make-up could KILL you: Deadly meningitis bacteria discovered in products”. It turns out there are a lot of articles on the internet discussing the horrors of expired makeup, the most recent ones linking back to a study done at the London Metropolitan University and funded by an independent cosmetic company. Oh goody — let the eyerolling commence! They found Eubacterium, Aeromonas, Staphlyoccocus epidermidis, Propionibacterium and Enterobacter growing in expired makeup. Of course, they have jumped to ridiculous conclusions such as because these bugs were found in expired makeup, expired makeup can cause an assortment of ailments from gastroenteritis to meningitis. For starters, most of those are really common microbes that are regularly found on skin so it makes sense they will be found in cosmetics. But where is the science?! 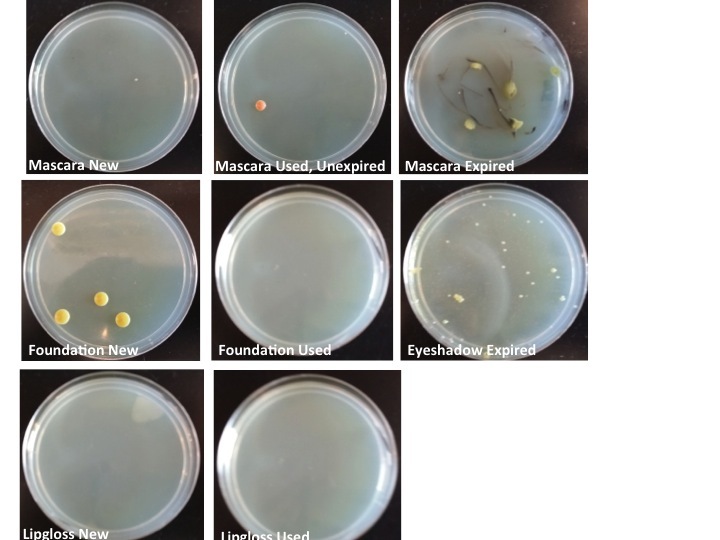 No one reported on any controls such as culturing bugs from unused or non-expired makeup. So I took it upon myself to debunk these outrageous claims. I plated inoculants of my unexpired, used makeup as well as unused versions of the same products. Finding expired makeup to plate in the Eisen lab was quite the challenge; but we finally got our hands on expired mascara and eye shadow. Of course this wasn’t the most elaborate of experiments, but it was still informative. Without any statistical analysis, it was quite obvious (from even the super small sample size) that more bugs actually did grow from the expired makeup (figure 1). Wait, so were all those online articles right? I looked up every single ingredient in the makeup and not surprisingly they are chalk full of antimicrobial agents with even some specific to just fungi, just gram negative bacteria, or just gram positive bacteria. These preservatives can degrade rather quickly, rendering them ineffective in cosmetics as soon as a few months after being opened. 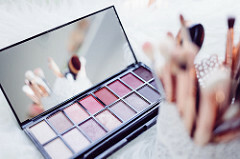 Therefore, expired makeup can turn into a breeding ground for microbes, pathogens not excluded. The articles that got me interested in this project take this information to a bit of an extreme, and fail to mention that a lot of the biproducts from degrading chemicals in cosmetics are actually quite harmful to us. While my mission to debunk the articles didn’t work out as I had expected, I won’t be losing any sleep over the idea that my makeup is going to kill me. However, if your makeup does have some weird colors, smells, or growths coming from it, I don’t advise rubbing it all over your face. Nice work and conclusion ….